The Origin of Life on Earth, part 2. - Food, Drink, Photography, and other things. The Origin of Life on Earth, part 2. In part 1, I discussed how early life may have arisen. In this part I will comment on one of the aspects of current terrestrial life - that of molecules symmetry or 'handedness'. Molecular handedness, which chemists call Chirality, is a property of the 4 bonds which a carbon atom can form. If a particular carbon has 4 different groups of atoms attached to it, then there are two ways of attaching them such that one is a mirror image of the other. These are the two chiral forms, which are referred to as D- or L-isomers depending on the particular arrangement. In the 'skeleton' form of the amino acid Leucine, shown below, triangles mean the bond is pointing towards the viewer and the 'ladder' is a bond pointing away. The centre carbon has the following 4 groups attached to it: Hydrogen NH2 'amine' group CO2H 'carboxylic acid' group CH2CH(CH3)2 branched carbon chain. In terrestrial life, amino acids are almost exclusively the L-form and sugars are usually the D-form. There have been references to this in science fiction, such as the Arthur C. Clarke short story Technical Error where a scientist accidentally has his molecules changed to the opposite chirality and he is unable to metabolise any food. If amino acid molecules are created by normal non-biological processes, there is usually a 50:50 mix of the D & L molecules (called a racemic mixture). Somehow, back when life was first beginning, there must have been a selective pressure on one form over the other. Samples of amino acid have been retrieved from meteorite fragments and these turned out to have an excess of the L-isomer. Experiments have shown that polarized light can produce such a slight excess so conditions may have accidentally selected for a particular isomer and we are left with the legacy of those conditions. Earlier this week there was a discussion on the Simon Mayo show on Radio 2 which was about what would happen if the moon disappeared. This was prompted by a discussion of the film Despicable Me and the sequence where the moon was stolen. It reminded me of a theory which stated that life wouldn't have developed on Earth if the moon didn't exist. The tides caused by the moon would have stirred up the precursor molecules and hastened any chemical reactions which would have led to life. An alternative version of this theory was presented in Star Trek: The Next Generation, where Q took Captain Picard back to the early Earth. Picard stirred up a 'soup' of organic molecules which mixed together to create life. The Origin of Life on Earth, part 1. This week's science posting is in two parts. Part 1 covers a few theories about how life arose on Earth. Part 2 goes into a bit more detail on the molecules of life. There are two main theories on how life started on Earth: It came from Outer Space, and it started here on Earth. I will briefly describe the two approaches. This theory claims that life came to Earth from elsewhere in the universe, and that there could be related organisms elsewhere in the galaxy. The approach was popularised by astronomers Fred Hoyle and Chandra Wickramasinghe, who believed that the process was still continuing today and that terrestrial outbreaks of disease could be caused by microbes brought to Earth by comets. It certainly appears possible that life could be brought to Earth this way. Experiments have taken place where microbes have been taken into orbit and exposed to space where they have been exposed to cosmic rays. This took place in 2008-2010 when a piece of rock was fixed to the outside of the International Space Station. Space is a very harsh environment compared to the surface of the planet: there is no water or oxygen, and no ozone layer or atmosphere to protect against the harsh light from the sun. When the rock was brought back to Earth, laboratory tests showed that the bacteria had survived. The surface of a comet is fairly hospitable by comparison. There might not be much of an atmosphere most of the time but there is some water and hydrocarbons which could provide a source of food. When the comet approaches the sun and warms up, clouds of gas billow out which could scatter any bacteria across the solar system where some could eventually arrive on Earth. Sadly there is no firm evidence for panspermia. No extra-terrestrial bacteria have been identified and there are no confirmed cases of bacteria of any kind being detected in comets. The closest we have is a meteorite which landed in Antarctica which has been identified as coming from Mars. This is the famous Allan Hills rock (known as ALH 84001) which had tiny features which looked like bacteria. Unfortunately these 'fossils' are much smaller than terrestrial bacteria so the identification as martian bacteria is not universally accepted. While panspermia is theoretically possible, there is no evidence that it has taken place or that bacteria is present elsewhere in the solar system. The main problem is that it doesn't explain how life actually began, it only moves the problem to somewhere else, so even if panspermia is true, there is still the problem of how life began in the first place. Abiogenesis is the process by which life arises from non-living matter. If life arose on Earth, rather than arriving from space, then the building blocks and conditions must have been present early in the Earth's history. The traditional view can be grossly over-simplified as: slowly over billions of years, different molecules reacted together to eventually create molecules capable of life. This process might sound like a lottery - pick a molecule, see if it works, if it doesn't then try again. In reality the process is more likely to have been gradual: pick a molecule, if it doesn't work then modify it slightly and try again. This is more like the old Mastermind board game where you picked coloured pegs and tried to guess where your opponent placed them, or the Battleships game where you had to guess the locations of the boats. If a solution is 'almost correct' then it will be used as the basis for the next attempt, instead of throwing it away and starting again. There have been attempts to replicate the conditions of early Earth to see if such molecules can spontaneously appear. The most famous of these is the 'Miller-Urey' experiment. Sparks were passed through an atmosphere of Water, Methane, Ammonia and Hydrogen to simulate lightning, which would break up the molecules to allow the atoms to re-join to form other molecules. The above gases were chosen because the elements they contain are sufficient to make 'amino acids' which are the building blocks for proteins and are vital for life (as we know it, at least). After a week, simple sugars had formed, such as ribose (which has a chain of 5 carbon atoms, unlike the 6 carbons in glucose and fructose which I mentioned last week). The amino acid glycine (NH2CH2CO2H), had also formed. Since then, molecules such as glycine and ethanol have been discovered in molecular clouds in space. Additionally the molecules adenine an glycine, which are known as 'Nucleotides' and are some of the building blocks of DNA, have been discovered in meteorites and comets. This proved that nature was capable of creating such molecules (and may suggest a compromise between panspermia and abiogenesis where the building blocks came from space but life arose on Earth). The next step, from simple amino acids to actual life, is the part which causes the most problems. For life to form, we need a way of replicating molecules instead of waiting for them to spontaneously form one at a time. In cells there are two main types of molecular replication: manufacturing proteins from the template provided by the DNA (transcription/translation) and DNA replication itself (which occurs when cells divide). At first glance it seems likely that the nucleotides which spontaneously formed may have joined together to form a primitive form of RNA (which stands for RiboNucleic Acid, which means it is formed from the sugar Ribose and Nucleotides, both of which have been identified in meteorites), but chemists have worked out the steps required and claimed that it isn't possible. An alternative chemical route has been suggested (Powner et.al, Nature, 14th May 2009) where each of the steps is plausible and all the of ingredients would have been available in the early environment. Creating proteins from RNA uses a giant collection of molecules called the Ribosome, which is so complex and specialized that it cannot have spontaneously developed in its current form. There are suggestions that a much simpler 'proto-ribosome' formed, which was a much less complex enzyme which could have self-assembled (Agmon et.al, Nature Proceedings, March 2009). In this way, life arose from simple molecules which were able to form in the 'primordial soup' which gradually led to more complex associations of molecules which ultimately led to something which we could identify as Life. Q: When Halley's Comet reappeared in 1969, that winter a flu epidemic killed more than 60,000 people in Britain. In 2008 Comet Nostradamus (and others) passed by, and now we face a flu pandemic. Is this mere coincidence, or were the ancients right to fear comets as bad omens and bringers of pestilence? What other natural disasters have been attributed to comets? An interesting question, and one which is wrong on almost every level. The question's author may be referring to the theory of panspermia, where micro-organisms or disease can be brought to Earth by comets. Unfortunately the question gets pretty much everything else wrong. Halley's comet did not appear in 1969. It was around in 1910 and again in 1986. I can't find any record of a Comet Nostradamus. There is a bright comet every few years - they aren't that rare so claiming co-incidence doesn't really make sense. Also the Earth passes through comet dust several times per year. The major meteor showers are associated with dust and debris from comets. If comets were all full of germs and pestilence, then there would be major outbreaks several times per year. At least the questioner didn't claim the world was going to end in 2012. We were in Bath because Emma was going to the hamster show. The show was very crowded so I decided to take the bus into the city centre and wander around for a few hours. Bath is packed with some great buildings but sadly the weather was very grey and dull while I was there, which didn't help with the photographs. I went to the museum at William Herschel's house, where he discovered the planet Uranus. I almost forgot about this years Perseid Meteors. It was about 11pm when I remembered. I had to get up early for work in the morning so I couldn't really stay out too late but we went into the back garden for a few minutes, long enough for us to see a couple of bright meteors streak through the sky. It didn't take long to drive to the Space Centre - I think it took as long to get out of Coventry as it did to drive the rest of the way to Leicester. Entry includes a film show in the planetarium style 'Space Theatre'. The film was called Big and was about the scale of the universe. Other highlights include Astronaut training which included a simulator ride to Jupiter's moons. While we were there, we had a quick look at the Abbey Pumping Station which was next door. 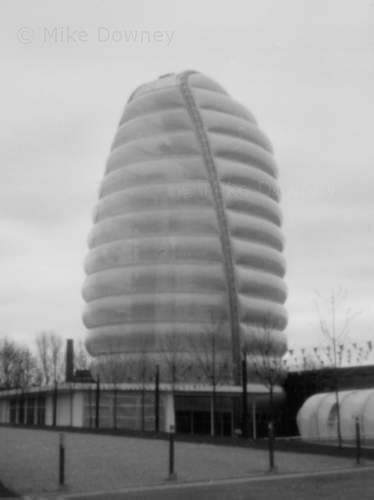 This was billed as Leicester's Science and Technology Museum but was on a much smaller 'local' scale. As the site used to be a sewage pumping station, a lot of the exhibits were to do with toilets and sanitation. I found this interesting: moon.google.com. It's Google's way of comemorating the anniversary of the moon landings. Zoom in all the way. The cartoon below came from a newspaper many years ago (probably the News of the World but I can't remember now). close-up.mpg (308Kb) - a short (19s) clip of the shadow falling across the face of the moon. out_of_eclipse.mpg (254Kb) - the wide-angled view, showing the moon coming out of the Earth's shadow. The eclipse itself was an orange/brown colour, rather than the bright red colour of previous eclipses. Unfortunately, the video cameras weren't sensitive enough to show the colours clearly. Both films were shot using normal VHS camcorders. The close-up view was captured using a camera fitted with a telephoto adapter, mounted on a normal photographic tripod. The tripod was regularly adjusted to keep the moon in the centre of the frame (next time, I will mount the camera on my telescope and use the motor drive, but the scope was unavailable at the time). The cameras exposure was altered to account for the changing brightness of the moon, otherwise the automatic exposure would overexpose the bright areas. 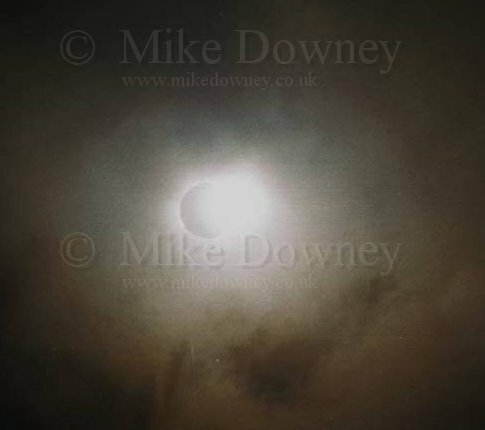 On the morning of Wednesday 11th August 1999, there was a total solar eclipse visible from Cornwall, south Devon, and across parts of Europe. I was luck enough to be staying on the Lizard Peninsular, in the far south of Cornwall. After a whole week of clear skies, the morning of the eclipse started cloudy. It remained that way , but about two minutes before totality, a small gap appeared in the clouds just in the right place for the sun to shine through. I got a glimpse of a thin crescent of the sun for a few seconds before the clouds rolled over again. By this time, it had started to go dark, and get slightly colder than before. The start of totality was obscured by clouds, but about 1 minute in, the clouds drifted away again, allowing us to see the eclipsed sun. Totality only lasted for two minutes, so that was half of the eclipse lost due to cloud. The rest of the eclipse stayed clear, and I stood next to my camera, just pressing the shutter, then altering the exposure and taking another photo. All of the photographs were taken using a Nikon FM, fitted with a Vivitar 75-205mm zoom lens, at the 205mm end. The film was Kodak Gold 100, and the exposures ranged from 1/500 to 1/4 s at f/8. For the minute where the eclipse was visible, I took a range of photographs with the range of shutter speeds mentioned above. The photo above was from the middle of the range - everything happened too quickly for me to actually make a note of the exposure used. 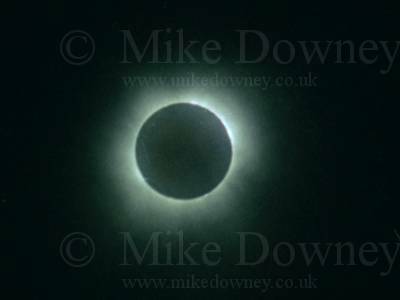 Unfortunately, although there was a gap in the clouds which the eclipse was shining through, there was also a thin layer of cloud lying in front which meant that the longer exposures picked up the cloud being lit up, rather than the solar corona. This also led to Baily's Beads and the Diamond Ring effect to be slightly obscured. The picture above was an attempt to photograph the Diamond Ring effect. The exposure was about 1/500 to 1/2000s, but the sunlight shining around the disk of the moon has also lit up the clouds. 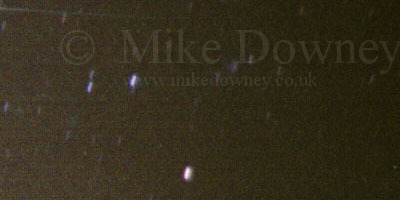 All the Hale-Bopp photographs shown here were taken from Anglesey mostly during March and April 1997. Details about the film and exposure accompany each image. Most of these were taken with a telephoto lens with camera 'piggy-backed' onto the telescope, to keep the comet centred during the exposure. 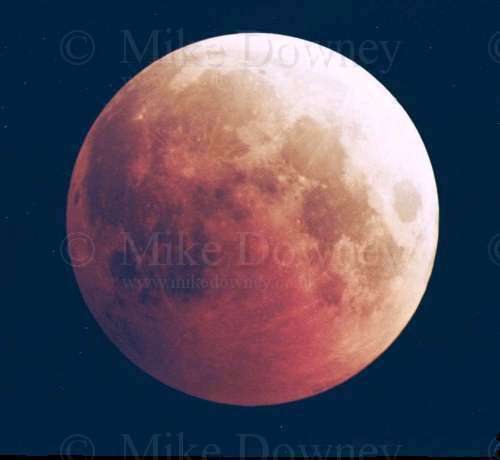 All of the photographs shown here were taken during the total lunar eclipse of the 26/27th of September 1996. Unfortunetely, here in Britain, we had to wait until the early hours of the morning, but since I missed the April eclipse due to cloudy weather, I made sure I saw this one. 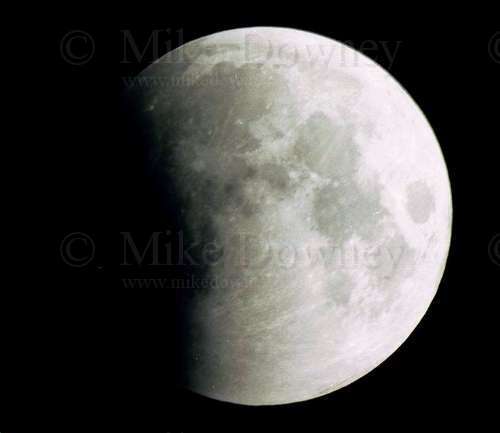 This was the first lunar eclipse I had seen since I bought my telescope, so I took as many photographs as I could, to increase my chances of getting some good ones. The two main photos here are probably the best of the lot - they were much better than I was expecting. 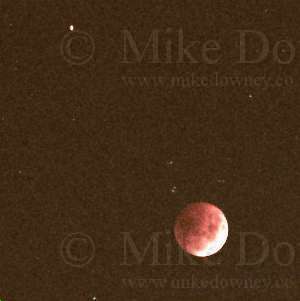 The second photo was taken at 02:30 UT, just as the moon was entering the 'total' stage of the eclipse. The exposure was 5 seconds, again on Fujichrome 400. I was surprised how light the eclipse was. According to the photographic exposures (1/1000s for full moon to 5s for eclipsed), there was a 5000fold decrease in light level, but the moon still looked a bright orange colour. The sky didn't get dark enough for me to see the milky way, which I can normally see very easily from Anglesey on moonless nights. Bright nebulae, such as M42, were clearly visible through the telescope. This third photograph was taken through a 200mm telephoto lens, and shows the eclipsed moon and Saturn in the same field of view. The photograph here was taken in 1996 and shows the comet before it approached Earth. This was actually a 'practice piggyback' photo, and it wasn't until much later that I found out that I had photographed the comet! 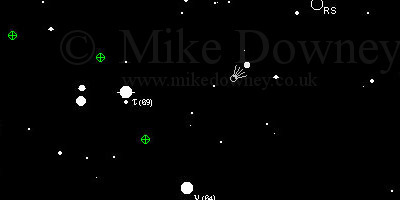 The above shows the comet (which is visible as a fuzzy blob between two stars). The stars are visible as small trails because the telescope wasn't polar aligned accurately enough - the exercise was to practice taking piggy-backed photos, the presence of the comet was an added bonus. 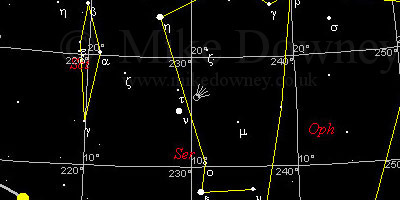 The chart below shows the location of the comet.